Serena Williams' comeback tour ended in Indian Wells, Calif., on Monday, but the fans got what they wanted: A Williams sister rematch. 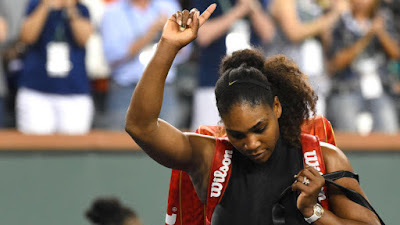 After Zarina Diyas and Kiki Bertens fell to Serena in straight sets (albeit with resistance), Serena faced the toughest challenge in her return: Her sister, the No. 8 player in the world. Venus won handily 6-3, 6-4, but the two squaring off felt like a big step for women's tennis -- and Serena herself. It's the first time the two have played a match against each other professionally since the 2017 Australian Open. Serena won that match while two months pregnant, 6-4, 6-4. The Aussie Open win was Serena's 23rd Grand Slam, putting her one behind Margaret Court for the most all-time. During Serena's year-long hiatus, Venus carried the torch. She didn't win any majors, but she did make it to the WTA Finals after a finals appearance at Wimbledon and a semifinal showing at the US Open. All of this is to say, Serena's loss is a mixed bag of takeaways. She had tempered expectations for Indian Wells from the start, making it clear she was trying to get back into the swing of things. And there was prevalent rust, even in her two wins. However, Venus is still a great player, coming off of a superb year. She got off to an awful start in 2018, losing in the Round of 128 in the Australian Open, but she's a high-ranked, terrific player. For Serena, it's a notch in the comeback belt: Play in a tournament -- check. Serena still wants that 24th Grand Slam, and she'll undoubtedly be striving for 25. It's Venus' first win over Serena in their last four showdowns, and their first meeting ever at Indian Wells. Right now it's Venus: 1 Serena: 0. But there's no question Serena will get a chance to settle the score.